Emmet Bradley gave a man of match display with an impressive tally of 0-7 as Derry saw off a very spirited London side in the National Football League to pick up their second win of the campaign. Both teams played out a very free flowing attacking football with only two points separating the sides the interval 01-05 to 00-10. For London Captain Liam Gavaghan gave an impressive display with a personal tally of 0-5 points. 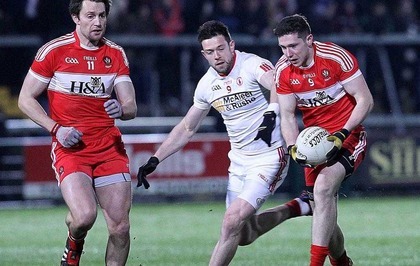 Derry never looked in any real danger in relinquishing their two-point lead as they turned up the style in the second thirty-five minutes and despite been reduced to fourteen players when Conor Mc Atamney was sent off for two bookable offences in the end, they ran out comfortable winners.